A couple of years back, in my first post on the Debbie Reynolds Collection, I mentioned that my tentative plans to attend the auction, and maybe even bid on something, were torpedoed by a purchase I’d just made on eBay. That purchase was a 16mm kinescope of the live TV drama The Day Lincoln Was Shot. For the benefit of those who don’t remember them (which is most people now), a brief explanation of “kinescope” is probably in order. In the days before the invention of videotape, a kinescope was the only way to preserve a television broadcast. There were certain technical refinements to the process — synchronizing the cathode ray scanner with the camera shutter, for example — but essentially it boiled down to photographing the image and recording the sound off a TV monitor. Videotape was in development all through the early 1950s, but was impractical for broadcast purposes until late in 1956, the year of The Day Lincoln Was Shot. The drama was broadcast on the evening of Saturday, February 11, 1956 (the eve of Lincoln’s birthday) as the sixth episode of CBS’s Ford Star Jubilee. Top billed were Raymond Massey (who else?) as Lincoln and Lillian Gish as his wife Mary. 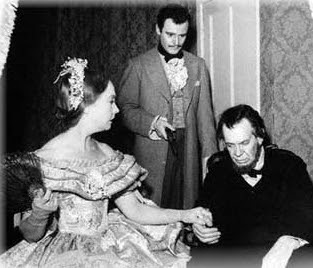 But the largest role in the teleplay, and its driving performance, was John Wilkes Booth. In this publicity shot (it’s not a shot from the program) the actor playing Booth may look familiar. He should: it’s a young up-and-comer named Jack Lemmon. Lemmon had been kicking around movies and live TV for several years, and just seven months earlier, in July 1955, he had premiered in his breakthrough performance as Ensign Pulver in Mister Roberts. A little over five weeks after the Lincoln broadcast, Lemmon would win his first Oscar, as best supporting actor in Roberts. In a symmetrical coincidence, Lincoln‘s director, Delbert Mann, would also win an Oscar that night for directing Marty, 1955’s best picture. I saw that broadcast of The Day Lincoln Was Shot; I was even aware of Jim Bishop’s bestselling nonfiction book, on which it was based (though I wouldn’t read it for several years yet). The night of the broadcast, I had already seen Mister Roberts, but being only seven years old, I had no inkling that the men who played the happy-go-lucky Pulver and the brooding, obsessive, angry Booth were one and the same. Even if I’d seen both as an adult, I doubt if I’d have made the connection; the two performances couldn’t be more different. Having seen The Day Lincoln Was Shot, and remembering it vividly all these years, I never dreamed that I’d ever see it again, let alone own it, but here it was. Watching it again after 55 years, I must say I was bowled over. The adaptation (by Jean Holloway and Denis and Terry Sanders) is that rarity, both good drama and good history, correct in nearly every detail. The studio reconstruction of Ford’s Theatre alone, which then still languished unused and unrestored after 90 years, was a marvel of accuracy. (The 1956 broadcast was in color, but it was kinescoped only in black and white — a frustrating omission, but probably a blessing in disguise. If they had done it in color, they’d probably have used Eastman Color, the cheapest process, and it might well have faded to nothing by now.) And Jack Lemmon was — there’s no other word for it — simply brilliant. At Cinevent this year in Columbus, I mentioned my kinescope of Lincoln to my friend Larry Smith, a nitrate specialist in the Film Preservation Section of the Library of Congress. (You can read more about Larry here.) Larry’s interest was piqued, particularly at the thought of a TV performance by Lillian Gish; such performances were comparatively rare, and surviving examples of them are even rarer. He asked me to e-mail him a reminder about it when we both got home. So I did, and Larry did a little research on the subject. He came back with news which, while it didn’t entirely surprise me, still gave my heart a not-so-little flutter: it seems that I have what just might be the only surviving copy of the kinescope of that landmark broadcast. At the very least, I can say this: if there’s another copy of The Day Lincoln Was Shot out there, the owner has never bothered to bring it to the attention of the Library of Congress. Larry told me that his higher-ups had agreed that, because of the broadcast’s clear historical importance, the LOC should borrow my print for digital scanning and preservation. I placed my 16mm print in the hands of FedEx that very day, and it’s now safely ensconced in the LOC’s facility in Culpeper, Virginia. The queue at the scanner is long, so it’ll no doubt be a while before I get it back, but naturally I don’t mind. Upon reflection, I do wish I had held onto it one more day and screened it so I could have a few screen shots to accompany this post — the dearth of images on the Internet lends credence to my suspicion that this is the only copy. But I don’t mind about that either. We all know that the cause of film preservation won’t wait, and I’m grateful to have had the chance to make this small contribution to it. Congratulations on your purchase and contribution. The very thought of it makes me tear up. How wonderful that you found this kinescope and that you provided it to LC for digitizing. You never know what you'll find on ebay, from trash to treasures, and occasionally rare jewels of film history. You should be proud. Congratulations, Jim. Thanks so much to adding to our film heritage. Wow – good on you for sending the kinescope to the Library of Congress! It would be sooo tempting to keep it, knowing it could be the only copy, and many would have done just that.